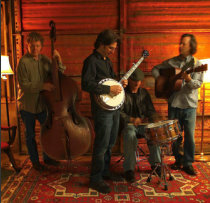 Bluegrass band ‘The Gregg Daigle Band’is all set to perform at Cowgirl, located at 319 S. Guadalupe St., Santa Fe, NM, from 8 – 11 p.m. Thursday, Dec. 6, 2012. This event is featured on Santa Fe’s premier on-line magazine and visitor guide, SantaFe.com. Bluegrass band ‘The Gregg Daigle Band’is all set to perform at Cowgirl, located at 319 S. Guadalupe St., Santa Fe, NM, from 8 – 11 p.m. Thursday, Dec. 6, 2012. Cowgirl has definitely provided great entertainment and food during all of 2012 with musical acts playing for the enjoyment of patrons on most every night of the week. Thursday, Dec. 6, 2012 is more of the same with The Gregg Daigle Band hitting the stage at the Cowgirl from 8-11 p.m.. This event is featured on SantaFe.com, Santa Fe, NM’s premier on-line visitor guide and magazine. Gregg Daigle remembers the first time he heard bluegrass music blaring over the loudspeakers in a warehouse where he picked, packed and shipped for a record company in the early 90’s. He immediately searched out a banjo and learned to play it while performing in the subways and squares of Boston, Mass. Already having a background in blues and classical guitar, Gregg was able to merge his love and mastery of the styles of music he was performing. In ’95 he moved to NM to continue his quest to find the spirits of Duane Allman and Bela Fleck. Today he performs with one of the most accomplished bands in the Southwest. Chris Plourde, who has worked with Gregg since his days in Massachusetts, sings and plays keyboard and guitar. Dave McCreary, who plays bass, has been performing professionally in NM since the early ’70‘s. Stu Sacco on drums has an impressive resume due to his extensive tenure in Las Vegas where he backed up the lik es of Billy Preston and Gladys Knight. Their fan site is at http://www.daigleband.com where you can listen to some recent recordings. Since 1993 the Cowgirl, which now occupies almost the entire block where it started, includes a restaurant, a billiard parlor, a commercial catering kitchen and several private party rooms. The patio is one of the most inviting summertime venues for locals and tourists alike and the Cowgirl has become a local institution. 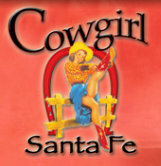 Cowgirl has definitely provided great entertainment and food during all of 2012 with musical acts playing for the enjoyment of patrons on most every night of the week.Thursday, Dec. 6, 2012 is more of the same with The Gregg Daigle Band hitting the stage at the Cowgirl from 8-11 p.m.. This event is featured on SantaFe.com, Santa Fe, NM’s premier on-line visitor guide and magazine.